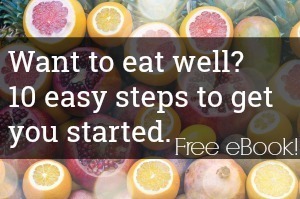 Do you need to eat well, but have little energy to put into cooking? One of the ironies about ill health is that it makes it harder to cook healthy food for yourself when you need it the most. This is especially a problem when you have long-term health issues. Often friends and family will bring you meals during a short-term acute illness (such as the flu), after you’ve had a baby, or after surgery. But about those who have long-term, chronic illnesses such as an autoimmune disease? It would be too much to expect to have people bringing you dinner all the time, but you may be just as much in need, especially during a flare. One of the promises of eating better ¬–especially a healing diet ¬– is that it may over time help improve your health. Dr. Wahls book, The Wahls Protocol , offers such hope. She used this diet to help reverse her own MS, and there are ongoing and encouraging studies using this protocol for other MS sufferers. In this version of a paleo diet, you concentrate on eating high amounts of vegetables every single day as a vital part of the protocol (3 cups of colorful vegetables, 3 cups of greens, and 3 cups of sulfur-rich vegetables). The autoimmune protocol diet is another healing protocol that includes many of the same principles. But the irony again. Sometimes when you are sick and in need especially of a healing protocol, you are most fatigued and most overwhelmed at making it work. You just would be happy to get anything on the table, let alone a special diet meal. If you have children to feed, then this becomes even harder. I know what I am talking about after an almost complete year of overwhelming health issues (more on that in an upcoming post). I was privileged to live in a community living building for part of this last year where dinner was made for my family (I would make my own dinner when I started the AIP diet). After we moved out, it was just us again. We made a lot of compromises on our food out of necessity, even while I tried to maintain a strict diet for myself. It was imperfect, but it was the best we could do. So the first thing I want to say is this – this new series I am started – The Low Energy Guide to Healthy Eating is NOT at all about perfection. Because my health is still up and down so much, there are still days when we are far, far, far away from how I’d like us to eat. Despite it all, we have managed to eat pretty well a lot of the time. One of my readers on my email subscription list mentioned the idea to me to do this series (borrowed from another blogger who did a similar series on low energy homeschooling). I thought it was a brilliant idea, and quickly wrote out a list of possible subjects to write about and recipes to share. This series will not be about perfection, even though I will address being on the AIP/healing diets with low energy. What I love about the series idea, is that everyone can glean from it. Whether you have low energy, are dealing with a chronic illness, or simply have little time, there will be something for everyone. I am really looking forward to addressing this topic, since it is so close to my own heart, my own situation, and my desire to share any tricks and recipes and ideas that have helped us get through a tough year of illness! If you have questions or ideas for this series, please use the contact form or comment below to let me know! I’d love to hear from you. Great idea! Looking forward to it. Good luck on your journey ???? Great idea! I would like to see very simple food options that don’t require special items like guar gum, etc, as I live in Ecuador, where these are not available. Foods that make us happy and satisfy us without harm. I appreciate your approach thus far! Sometimes the brain fog makes me uncreative, so I need new ideas. Thanks for slogging on with and for us all! Dear Sandra. I know a sufferer of trigeminal neuralgia, so I can appreciate the level of pain you go through. This person was able to get rid of hers by taking a high quality Calcium-AEP supplement, which directly helps the nerves. Please look into it…perhaps it could help you as well! I *love* idea for a series of posts. Such a great idea, and you’re the perfect person to write it. I’m excited to follow along and learn from your experience and encouragement. xo! What a wonderful idea! I can tell you from personal experience that this is also needed for when we are in caregiver roles. My husband passed from cancer and now I am helping cook for my elderly mother. Cooking healthy meals for myself too often takes a back seat and I feel it. Looking forward to this series – you are such an inspiration to me! Wonderful idea! I myself have been on the GAPS diet and I have Rickettsia which is similar to Lymes. I can’t keep up with eating healthy with my low energy and working fulltime. I am especialy looking for quick breakfast ideas that doesnt isnt high in carbs and sugar (so no porridges and muffins). And easy quick meals that dont require much planning. I dont have the mental energy to plan. Can you please share what you are doing to address the Lymes. I live in South Africa and struggle to address my disease through a more natural approach. I am very excited about this series. I’m an acupuncturist. I look forward to tips and tricks that I can apply myself, but even more vitally tips I can pass onto my patients who are struggling to get nourishing food on the table. Need this series. This is me also. Hope you feel better Kimi!